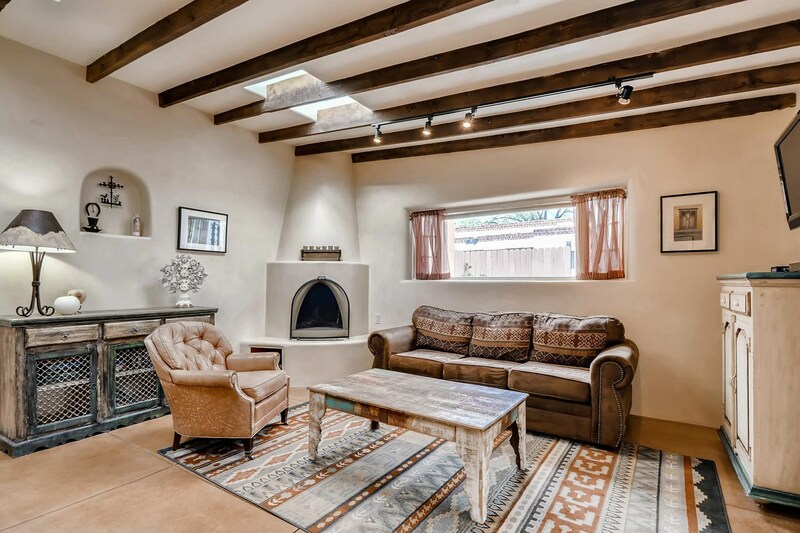 Beautiful spacious one bedroom Historic 1930 Adobe home totally restored with adorable guest house. Won Santa Fe Builder&apos;s Association Best Whole House Restoration Award 2012. Features include gorgeous hand hewned 100 year old beams and vigas, hand plastered adobe walls, poured concrete, wood and saltillo floors all with in floor radiant heat; lovingly appointed kitchen with quartz counters and deluxe stainless appliances; dual shower head with deep soaking tub; sky lights; kiva fireplace and a peaceful ambience mere steps from superior dining. Private courtyard walls with potting shed, and sunroom. Excellent established short term rental income. Guest house is $125 night and Main house is a monthly rental in the amount of $2200. Total net revenue for 2018 equaled $37,000. Stroll to Vinaigrette, Modern General, Farmers market, Sage Bakehouse and Radish and Rye to name just a few. also, one block to Whole Foods. Some furniture included. Directions To Property: Shares Easement With Modern General. Drive Up Don Cubero Alley - Park In Back Next To A.